1991 was a very, very good year for Roger McGuinn. In January of that year, the ex-Byrd guitarist and vocalist was inducted in the Rock and Roll Hall of Fame with the other members of the influential 1960s/1970s band. In addition, a four-CD career retrospective box set The Byrds, issued the previous October, was the band’s first charting album in 17 years. And this perfect storm was the opportune time to release his first solo album of new material since 1977. Known for the mid-1960s pop/rock/folk hits including “Mr. Tambourine Man” and “Turn! Turn! Turn!,” The Byrds soon embraced a number of styles, including psychedelic rock (“Eight Miles High”) as well as country rock (“You Ain’t Goin’ Nowhere”). A dizzying number of lineup changes occurred throughout the band’s nearly decade-long career, which ended (ironically with a full “original band” reunion) in 1973. In the ensuing years, The Byrds have been cited as an influence on a large array of rock acts, including the Eagles, Tom Petty & The Heartbreakers, R.E.M., The Bangles and many, many more. Band members occasionally paired up (McGuinn, Clark & Hillman, The Flying Burrito Brothers) and McGuinn released five albums on his own between 1973 and 1977. The McGuinn-Hillman album of 1981 was his last recorded appearance prior to Back From Rio. 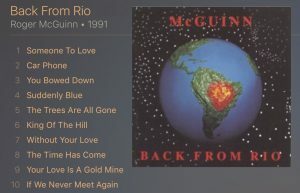 Peaking at #44, Back From Rio was McGuinn’s highest charting album outside of The Byrds. While the album received wide-spread acclaim critically and was a commercial success, it didn’t provide any career traction and any chance for a hit follow-up was squandered; the next two releases under his name were a late-1991 compilation collection from his 1970s solo career and a live album released in 1996. The next album of new music didn’t occur until 2004; his only notoriety during that period was his Capitol Hill testimony (next to Metallica’s Lars Ulrich!) at 2000’s “Downloading Music From The Internet” hearings. He has, however, performed live fairly consistently throughout his career.